One never knows what to expect on a day at the farm. Every day comes with a new challenge or experience that makes me appreciate farming more than the day before. I remember one day that quite literally knocked me off my feet. It is a routine practice at the farm to rotate the sheep and cattle around the plot. This way, the animals can not only have a fresh grazing area, but the farm can also more easily manage the grass height and encourage soil health. It was after one of these typical sheep herding jobs that I was propositioned to do a very atypical job (the likes of which I never imagined myself doing). It started like any other herding experience with the sheep bobbing after me in hopes of reaching their favorite grain that I tantalizingly shook as I led the way. Bella (pronounced Baya), the farm’s helpful Australian Shepherd, was at their flank with two interns, Alex and Claire. When we reached the destination, a new enclosure fresh for their grazing delight, I dropped the bucket of grain as reward for their cooperation. Alex then began to describe one of the young sheep that was happily nibbling away to my left. I knew what was about to come next was no good. The sheep was apparently suspected of having parasites. In order to check for certainty, I was the one who was going to catch him. After some careful thought and a few deep breaths, I lunged for the young sheep and in one fell swoop I latched my hands onto his coat with a mechanical-like grip. The others darted away in chaos as I was knocked down but retained my grasp. He repeatedly sprang for the air in an effort to escape my clutch, but Alex embraced the sheep right before he was successful. With both of our hold on him the sheep had little choice but to relax in our grip. 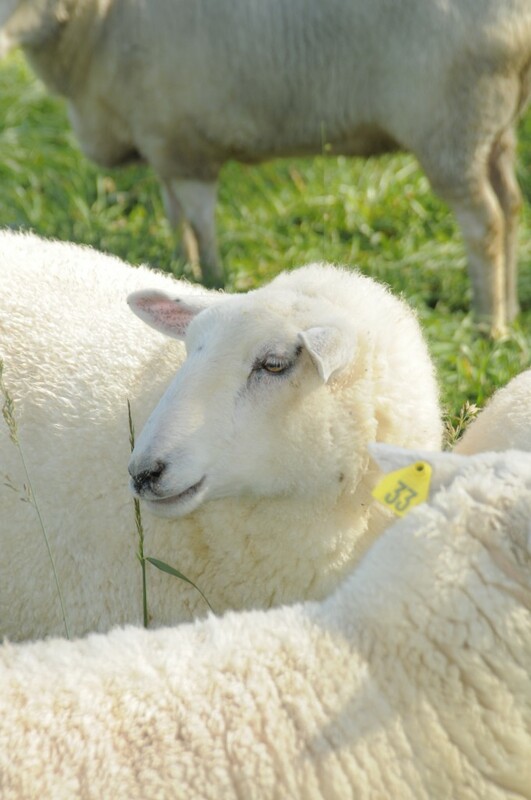 Young sheep are more susceptible to a blood-sucking parasite known as the barber pole worm that can cause anemia due to loss of blood and protein. This commonly results in a sheep with a pale eyelid, whereas healthy sheep have red eyelids. After confirming that this particular young sheep had eyelids that were rather pink, Alex took a stool sample to be on the safe side. The young sheep then leaped for safety after I released my grip. After being able to relax, I finally smiled at my success of doing something so out of the ordinary and unexpected. More so, I was overjoyed to have played a part in helping an animal with such a tight grip on life.